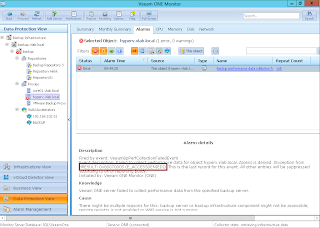 One of the nicest thing Veeam One 6.5 added is the support to monitor and report on your backup infrastructure. 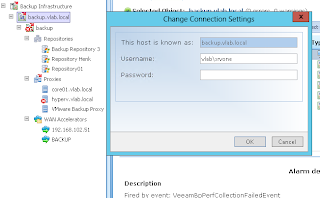 In Veeam One 7 the possibilities are now expanded. For example a lot of reports for Backup & Replication has been added. 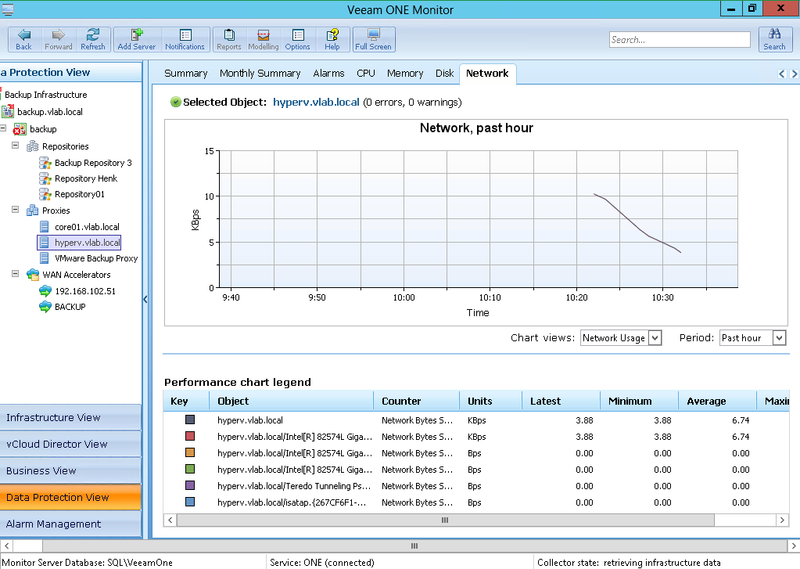 For the monitoring part, you can now really monitor CPU/MEM/Network via One console. One will collect the data via WMI so it is a pretty standard approach. It is really interesting as I often have customers telling me that B&R reporting is limited. 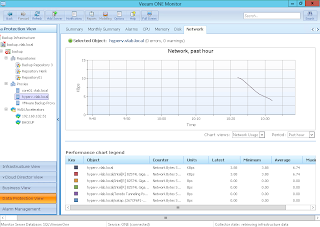 Then I will show them Veeam One reporting and they will be blown away. Sometimes it even happens that the customer has a Veeam Essentials license and that he is unaware of the fact that he already has the licenses for One. 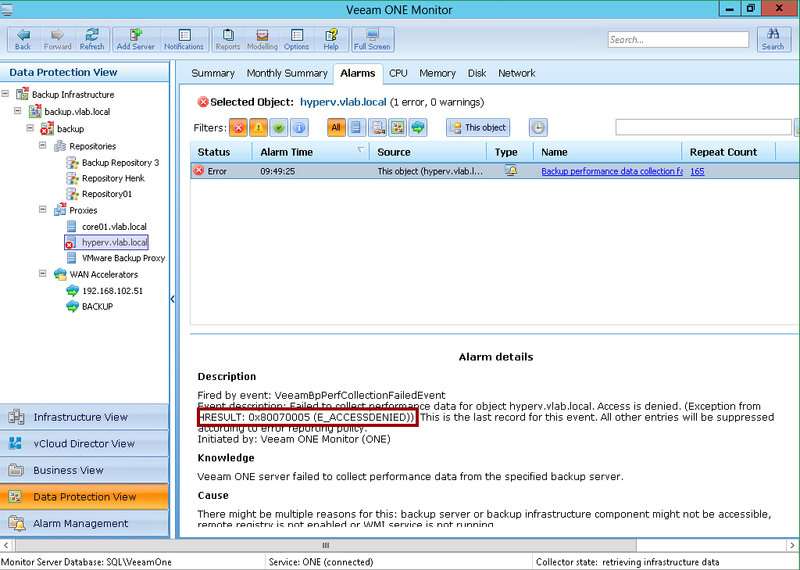 Basically Veeam Essentials is the Veeam Backup Management Suite but limited to 6 sockets. To start using it just go to the Data Protection View, right-click the Backup Infrastructure node in the inventory pane and choose Add Server from the shortcut menu. I would recommended adding the enterprise manager so that all your backup servers are automatically added. 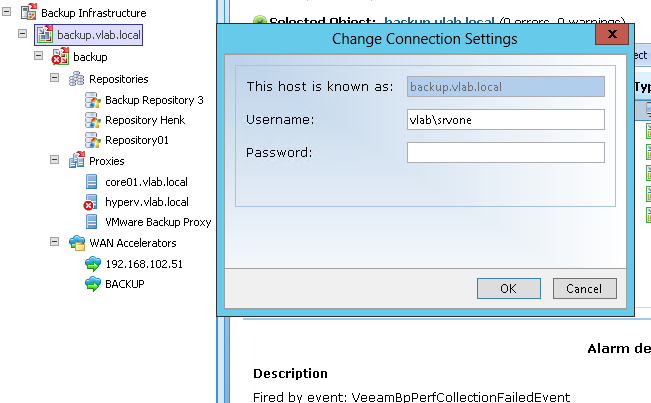 When you add Veeam Backup & Replication to the Veeam One server you will use a certain user to connect to the backup server. Most cases it will be a separate service user. In my case I use "vlab\srvone". This make sense as Veeam One uses the same credentials you specified when adding the enterprise manager. 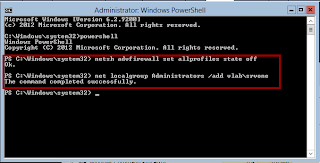 You can check the credentials used by right clicking the enterprise manager and clicking "Change Connection Settings"
So if you are in this case, it probably means that srvone is not added to the local administrator group on your proxy servers. There are 2 things you can do. First of all you can right click the component and override the credentials for that certain proxy or repository. 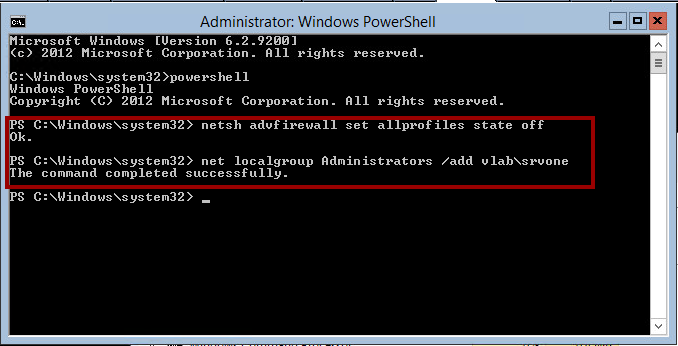 I had to do this for a remote repository / wan accelerator that is not in the domain.